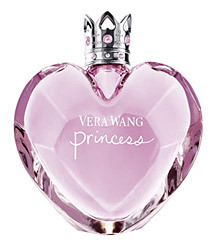 With the wildly popular original Princess, Vera Wang’s Flower Princess flanker is a follow-up that wanted to appeal to cute culture (it exists). Not sure why they had to create a flanker to pitch the Princess line to the cute revolution. The original Princess is practically an embodiment of cute. I don’t even like cute. In Bottle: Light florals and not a whole lot else. As I understand it, Flower Princess apparently did away with any sense of discretion and amped up the flowers. Applied: Smells like flowers upon initial spray and top note discovery leads to more flowers. Indescribable flowers that mix into a miasma of floral that I can’t even begin to separate though the mimosa in this peeks its head up from the Flower Princess shaped hole to say hello now and then. Flower Princess is pretty true to her name at this point in time as the concoction of light florals starts dissipating. The mid-stage is very similar to the original princess, that sweet, floral scent though it is missing the dark chocolate note. I actually miss that dark chocolate note. It was my favorite part and it gave the original Princess something to brag about. The dry down is also extremely similar with a warm, vanilla and clean musk exit. Extra: The thing about Flower Princess’ availability is interesting. It’s permanently available in the Asian market but is a limited edition for everybody else. You can no longer get a bottle of this stuff unless you’re in an Asian country. Why? I don’t know! Probably has to do with the prominence of cute culture in places like Korea and Japan. But if you’re looking to get Flower Princess, hop on a plane. Design: There isn’t a whole lot of difference between Flower Princess and Princess’ packaging. Actually, I think they’re exactly the same with Flower Princess having a pinker hue to it and a silver cap instead of gold. Other than that, they’re identical. Notes: Green ivy, tangerine, water lily, orange flower petals, Moroccan rose, exotic jasmine sambac, mimosa, apricot skin, amber, precious woods, musk. I found Flower Princess to be a little less invasive on the sweet side though I’m not wild about how uninteresting it is as a flanker. It is just a bit more grown up than the original Princess though. Reviewed in This Post: Flower Princess, 2008, Eau de Toilette. This entry was posted in floral, Reviews By House, vera wang and tagged cute, flower, flower princess, fragrance, mimosa, perfume, princess, review, scent, vera, vera wang, wang. Bookmark the permalink. I love this vera wang perfumes because they was some special fragrances and very like this smell, i ever use this perfumes only.